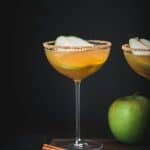 This apple pear martini is fall in a cocktail! Pour water and sugar into a small saucepan heated to medium low and stir until sugar is dissolved. Add cinnamon stick and bring to a boil. Cover and remove from heat. Let sit for 30 min – 1 hour to infuse. Remove cinnamon stick. Store leftover syrup in a container in refrigerator for 1 1/2 weeks. Mix together sugar and cinnamon for rim. Dip rim of glass in a bit of simple syrup, then in the sugar/cinnamon mixture. To make cocktail, combine all ingredients in a cocktail shaker over ice. Shake about 30 seconds, then pour into martini glass. Enjoy immediately. Pear flavored vodka is optional – feel free to substitute with your favorite regular vodka.